Our review of Scrabble is more like a mediation on how to approach it as a war-game than it is a piece of game critique. I think Scrabble gets an unfair rap because so many people think It’s a word game and I am the first to agree it is astoundingly mediocre, at best, in that category. You don’t get adequately rewarded for making good words in Scrabble. All of the scoring potential is bound up in making good plays and that’s an entirely different beast. To be honest, I had never even intended to write a review of Scrabble but it has appeared on high up in two of our Top Ten lists (2017 and 2018) and there’s every reason to believe it will appear on more in the future. As such, it deserves some focused attention. 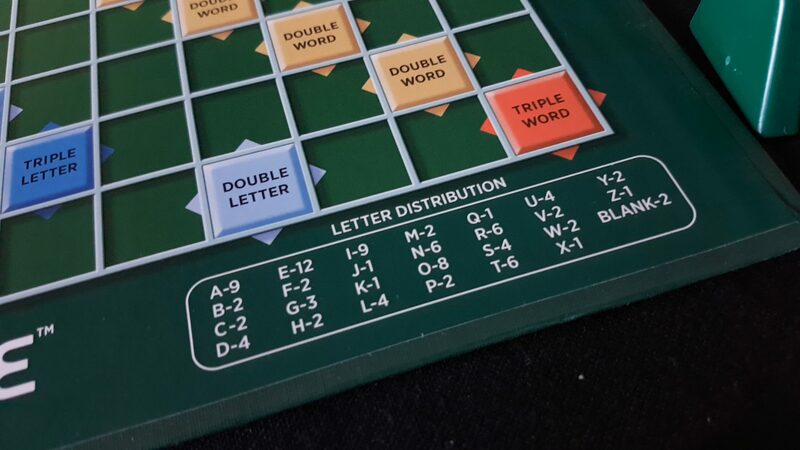 There are numerous accessible versions of Scrabble out there (for example, this), but they overwhelmingly tend to be aimed at users with visual impairments. That means that we have a lot we can talk about here with regards to its suitability for other users. Come on then – these tiles aren’t going to teardown themselves. I’m weirdly delighted that TEARDOWN is indeed a valid Scrabble word. 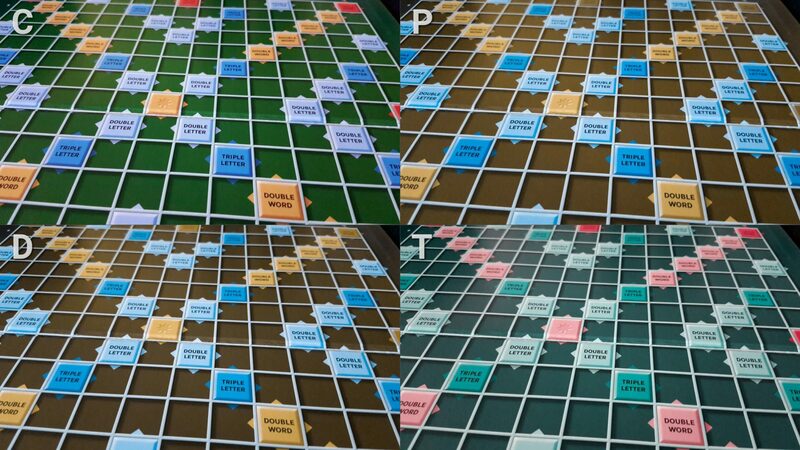 Scrabble has had many different versions over the years, but even so it’s a little bit humbling for some modern games to consider that this comparatively ancient title has no problems with colour blindness. 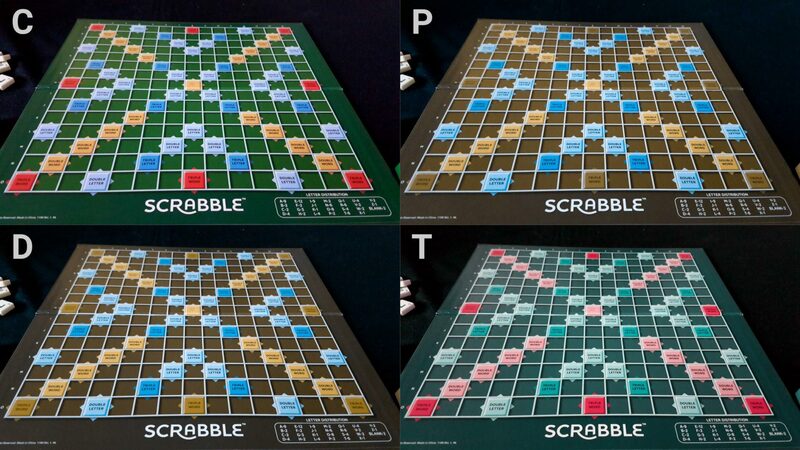 Even using the colour cues alone, Scrabble is a mostly accessible game since the colours chosen are distinctive enough to be differentiated under most circumstances. However, each tile (except for the centre) is also prominently marked with its effect (double word, triple letter and so on). The centre tile is also a double word tile but this is indicated instead by a star. Tiles are monochrome and as you would expect they exhibit no problems for people with colour blindness. We strongly recommend Scrabble in this category. The standard Scrabble set is far from ideal in this category, suffering as it does from problems of game state sprawl, precision of game state, and issues of orientation. Words may be read left to right, up and down, and form dense knots of letters potentially forming many other words, the state and position of each being important. There are no tactile indicators on the board or the tiles, although the letters on each tile are well contrasted and relatively large. The problem isn’t so much reading the tile rack, at least for those for whom minor to moderate visual impairments are to be considered. The problem comes in relating these tiles to the board and the tiles that have already been played. Most of playing Scrabble is a process of mentally crunching over where certain patterns of word will fit to score optimally amongst other patterns of words. Close inspection of the board would allow for some of this to be done, but there is often a more holistic aspect to play. With time, players can recgonise promising combinations of tiles and it’s only as groupings that some of these will become apparent for their value. That said, this problem does tend to become less pressing as the game goes on because opportunities become harder to find. Unfortunately at exactly the time this happens it also becomes increasingly important to identify the options for junking problematic tiles. You get penalized for each one still in your possession at the end of the game, so sometimes you’re looking for ‘An A or an O that is open’, and occasionally that will impact on other choices available. The possibility space gets smaller but it also gets a lot spikier. Mostly the play space will shrink as play goes on, but the use of two and three letter words means you can rarely truly discount any part of the board as being ‘full’. The best and most unexpected plays come from taking advantage of opportunities that may arise as a result of emergent tile placement. The whole board, more or less, is always important and the parts that aren’t important are sometimes not obvious or do not remain so for the whole length of the game. We don’t recommend Scrabble in this category, but bear in mind there are more accessible sets available. It’s certainly possible to play Scrabble without stressing vocabulary, positional awareness, or excessive amounts of numeracy. However, this is a fragile kind of play. Scrabble is inherently a competitive game, and it’s necessary for players to be roughly balanced in capability for it to be fun. It’s one thing if everyone is playing words like DOG and LAMP and LEGS. It’s entirely another if one player is focusing on small, simple words and another is then building compounds or extensions on top of them for larger point yields. Aggressive play, as discussed in the review, will focus on exploiting the power of small words to make combos that can score considerably more than any individual word. If any of these fall out of alignment, the rest of the game becomes hugely problematic. Let’s say though that you have a set of players for whom this can all be assumed. Scrabble is a game that approximately scales itself to the levels of the players. If three- and four-letter words are the norm, then there is nothing that mandates longer or more complex plauys. The main difficulty here comes from the fact that every word other than the first must be built using letters of another and it can be cognitively expensive to assess when this is possible or appropriate. The HAZY is impacted by a triple word tile and a double letter tile, the HE is impacted by a double letter tile, and the AR is impacted by neither. That means the scoring is compound and situational and it’s easy to make mistakes. Again this is only a problem in (slightly) more advanced play where multiple words are being made with single tiles but that’s going to happen on occasion even with easier and smaller words. HAZY also has a blank that isn’t included in scoring, and everyone is going to need to remember that the blank is a Z with no prompts provided. Essentially every time you see a blank on the board you either need to work out or reverse engineer what letter that is – it’s a wildcard that takes on a fixed value upon placement. Scoring well is as much about placement of words as it is about the word itself, and there’s a lot of shuffling and anagramming of tiles to work out what’s going to be optimal. DOG is worth four points but if you placed the D on a triple letter tile you’d get nine points. You’d only get seven if you played the O on that tile. Whether you can do this depends on all the other words you could make and whether they’d still be valid in combination with the game state into which they need to integrate. The risks of placing tiles in particular locations on the board are also intensely asymmetrical. With the HAZY play above for example it’s easy to make a word using AR as its branch to take advantage of the double letter tile. Knowing the two and three letter words is important for skilful play but it’s not actually required for fun play. However, much of what you do in Scrabble will be to look at a word and think ‘Is that an actual word, and if it is – is this how it’s spelled?’. There’s a reason why Scrabble dictionaries exist – they are important and convenient tools for quickly assessing the validity (rather than the meaning) of words. Technically speaking you cannot consult a dictionary during play but I would advise relaxing this rule for maximum cognitive accessibility. I’d also suggest you make a chart of valid two letter words available to everyone during the game. All of this basically comes down to this – you can probably play a cognitively accessible version of Scrabble between well matched players but it’s not really a particularly promising prospect. There are many more games we’d recommend rather than forcing Scrabble to fill that role. For those with memory impairments only, we actually have the slightly odd situation that they’re likely to be in a worse position than someone impacted by both. Cognitively accessible play can focus on playing small, simple words. If the problem is that someone has memory problems they may be perfectly capable of making good words but unable to search their memory to find the words that they would absolutely understand. In such circumstances I would think a player would become frustrated in the extreme. We don’t recommend Scrabble in either of our categories of cognitive accessibility. The tiles with which players are provided are not necessarily the easiest to play with – the constraints of the board are quite tight and it’s very easy to upset the entire state of the game with a mist-timed shake or shove of geographically distant tiles. Players are often laying down tiles in quite tight constraints because one of the easiest ways to rack up good scores is to build compound plays made up of multiple words. Aggressive play, as discussed in the review, will tend to focus on tight words that make maximum use of limited space. You may find occasionally you’re playing with heavily compounded and re-used tiles. Play also tends to occur across the whole board without any of it genuinely becoming irrelevant to any player. That means the board can’t really be re positioned through play for comfort. There’s an issue here too in that shuffling tiles is massively important to good play. 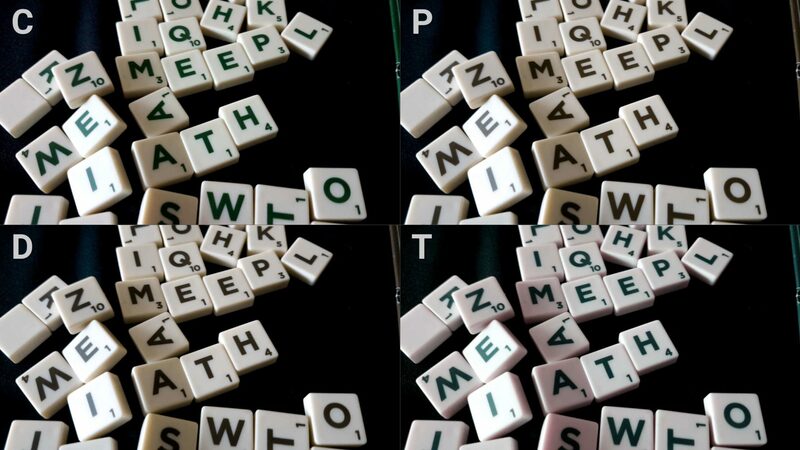 The jumble of letters available on a tray are likely to be meaningless until a player begins to enforce some order on them and that might involve a degree of ‘random search’ and breaking letters away from others. You might want to separate our your S or ING so as to more easily consider smaller words for potential play. You might want to shuffle them randomly until inspiration strikes. A lot of what you do with your tray is experimentation and the role of serendipity means it’s not always possible for someone to action that on behalf of another player. That aside, the game does otherwise support play with verbalisation. The board comes with chess style referencing along the edges (more games should do this) and that means instructions like ‘Play my first tile at position E5, my second at E6, my fourth at E7’ become possible to unambiguously issue. It’s an awkward circumstance though especially when you take into account the likely incompatibility of shuffling tiles with a corresponding need for verbalisation. We’ll very tentatively recommend Scrabble in this category, but that recommendation becomes very fragile the less fine-grain motor control can be assumed from a player, or the extent to which players can compensate for the difficulty in shuffling tiles. There are apps available that act as digital scrabble trays but we’re generally loathe to recommend third party solutions in these teardowns. The problems come in here primarily when there are two mismatched mindsets. It’s terrible to play Scrabble for its words when someone else is playing it for the area control. Score disparities in this respect tend to be incredibly high because it’s a bit like always playing rock when someone else always plays scissors. Big words open up lots of the board and an aggressive player will be looking for ways to capitalise on that. 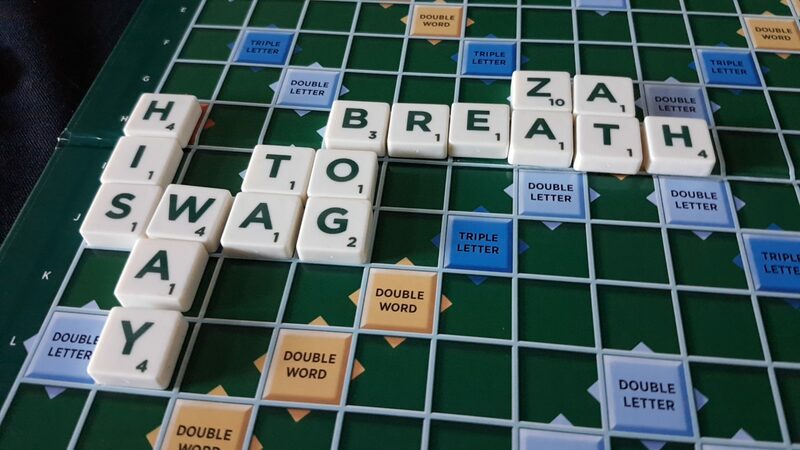 I’m not lying when I say people rarely play Scrabble with me twice, and I fully understand why. Its not fun for me as a word game, and it’s not fun for them because it’s not fun for me as a word game. Since Scrabble also seems to stress specialist knowledge, it’s easy for players to mark poor play down to their own lack of intelligence. While the randomness of tile draws is something of a leveller Scrabble is definitely a game where the best player will win far more often than a weaker player. Professional Scrabble players will concede that luck is the determinator in between 10% and 20% of games, and the rest is down to skill. The problem is that the skills that go into being the better player are not intuitively obvious and they don’t neccessarily track with real world competence with words. They’re to do with weaponizing very niche knowledge like the valid two and three letter words and certain profoundly powerful tile patterns on the board. The player that is the most articulate in play shouldn’t win. Unfortunately, that feels unfair and you can hear people remark on it in the common discourse around the game. There is a persistent feeling that the smaller words are unsporting and that it’s a cheap move to play them. 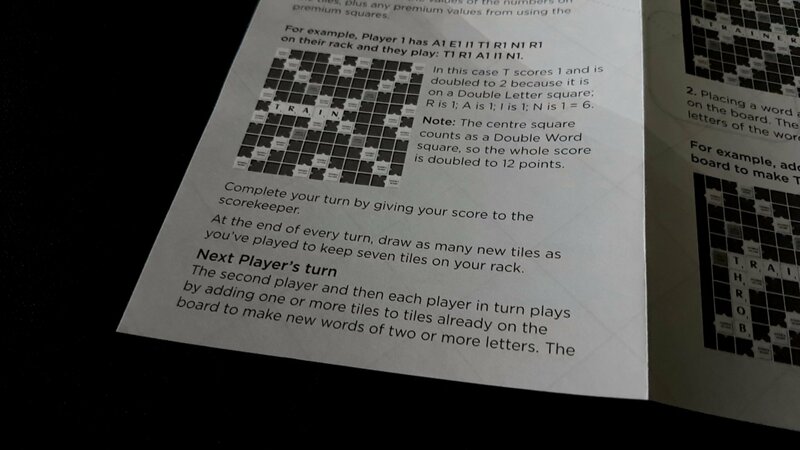 There are lots of rules people tend to layer on top of Scrabble to make it feel like a more balanced game. ‘You can’t use a word you can’t define’, or ‘You can’t use it if it’s not a word we all recognise’ or so on. These are band-aids that don’t actually fix anything – I can certainly define for you all of the two letter words in Scrabble and most of the three-letter words. QIS? It’s the plural form of QI, which is a kind of spiritual force in Chinese philosophy. BO? JO? They’re both fighting staffs used in certain martial arts like Bojitsu. The result is a game where it’s easy to come away feeling very aggrieved and foolish. It’s bad if you play DOG and someone else plays LITHIUM for the bonus fifty points. It’s also bad if you play something like Whimsy (a lovely word) for 17 points only for someone to then turn it into fifty of their own with the word EGGS. There is such a dramatic imbalance here that no matter your vocabulary it’s easy to feel stupid if two people are played a mixed perception game. We’ll tentatively recommend Scrabble in this category, on the explicit proviso that everyone has the same philosophy on what is considered ‘fair play’ during the game. Anything else will likely end badly. 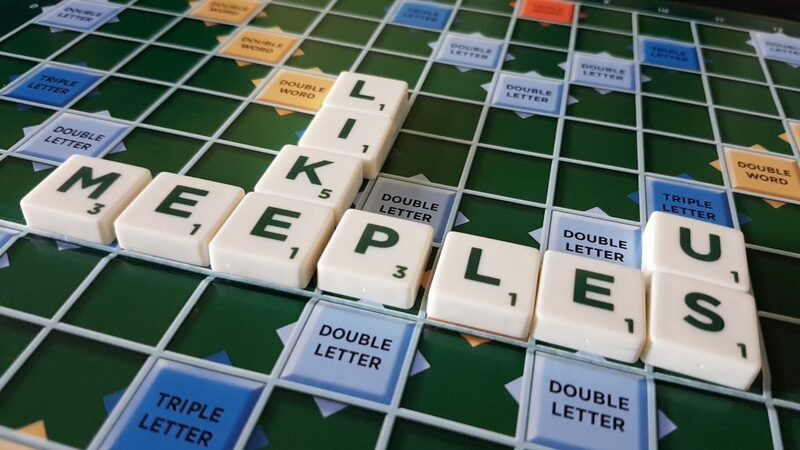 Scrabble stresses literacy in an unusual way – it doesn’t necessarily require a huge vocabulary so much as it requires a situational understanding of disconnected words. It’s also one where I suspect linguistic background is going to be a factor. Every native language version of Scrabble, even ones that (mostly) use the English alphabet, will have a subtly difference balance of letters and thus frequency. That’s going to subtly distort the way people approach the game because they are at least on one level influenced by what their natural inclination says about how common letters are going to be. There are 13 As in the Irish language Scrabble. Only nine in the English one. There are similar adjustments with regards to points value across tiles. There is no formal need for communication during the game, but it’s common for words to be challenged. The rules for dealing with that are often handled with house rules such as ‘You need to be able to define it and see it in an agreed upon dictionary’. This again is an aspect of literacy that is not often stressed in the games we examine for Meeple Like Us. Whether this is actually a problem will depend on the group but – like Monopoly – this is a game where house rules are likely to have considerable force of law. Interestingly though, it’s not actually necessary to speak the language in order to excel at Scrabble because there are no formal rules that require words be known. Only that they exist in the official Scrabble dictionary. The new wave of championship Nigerian players are dominating the game without necessarily speaking any English at all, and similarly with New Zealanders mastering French Scrabble. That though should perhaps not be considered a traditional approach to play. We can only very tentatively recommend Scrabble in this category. There is no gendered art in Scrabble, and the manual defaults to referencing ‘the player’ throughout. Absolutely no problems there. Being a mass market title you can pick this up for prices that often seem utterly baffling in comparison to what we’ve come to expect from more hobbyist titles. Scrabble has an RRP of £20, often discounted down even further in supermarkets, and while it thrives at two players it will happily support up to four. It’s also a game that is relatively frictionless to introduce into play because the chances are everyone already knows how. Admittedly though, some might be wary as a result. We’ll strongly recommend Scrabble in this category. A vision impairment that intersects with a physical impairment is likely to be an issue because of how much of the board that would need to be close examined. Orientation of letters in that circumstances is also likely to be a significant problem. Those where a communication or emotional impairment intersects with a cognitive impairment will also want to be especially wary of Scrabble because it’s almost designed to exacerbate self-perception problems as a result of these accessibility issues. 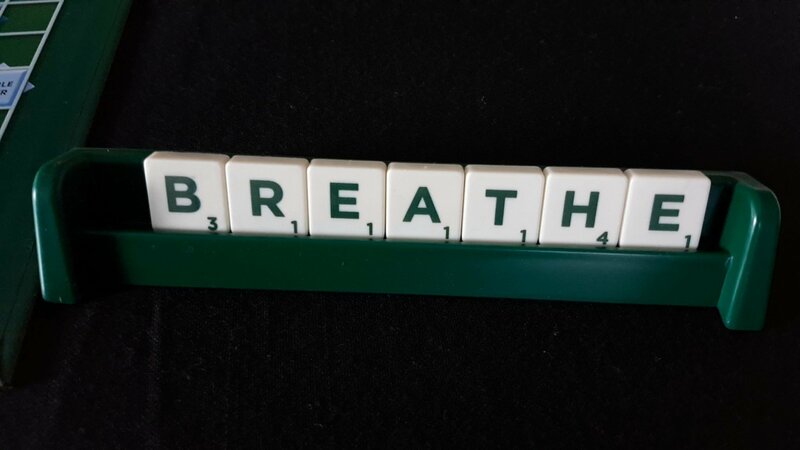 Scrabble isn’t a short game, but it’s also not long enough in and of itself to be a particularly risky game as far as exacerbating distress or discomfort is concerned. Like chess though, it’s a game that does lend itself to a declaring a draw ahead of a final conclusion – at least in two player circumstances. However, being an intensely competitive game Scrabble is also a game that tends to disincentivise players from offering spontaneous accessibility support. If I’m hoping you play a particular letter in a particular place, it’s not in my interest to point out you did even if I suspect it might be as a result of an accessibility issue. It’s not quite that you’re employing subterfuge but rather you’re hoping the cognitive cost of playing the game leads to people making careless plays because there’s so much they need to be taking into account. Just something to bear in mind. 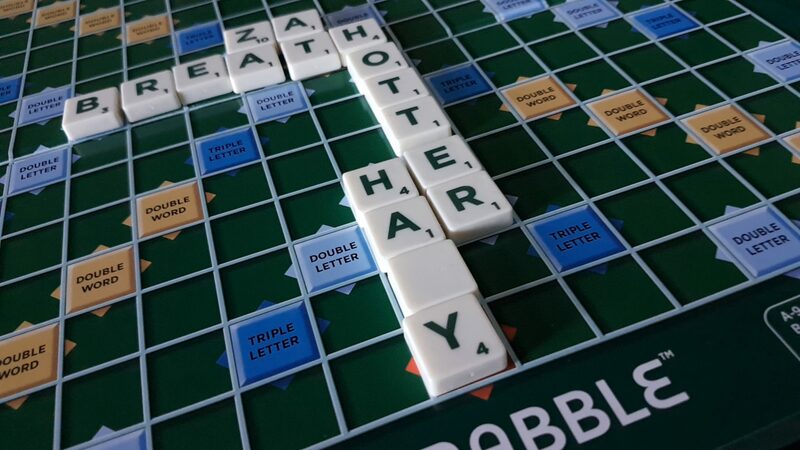 Oh my God I love Scrabble. One of my very few five star games, and while it’s not the common kind of fare we discuss on Meeple Like Us I think it still deserves a place in almost every collection of almost every player. If you approach it with the right mindset it’s a far better game than a lot of people have given it credit. 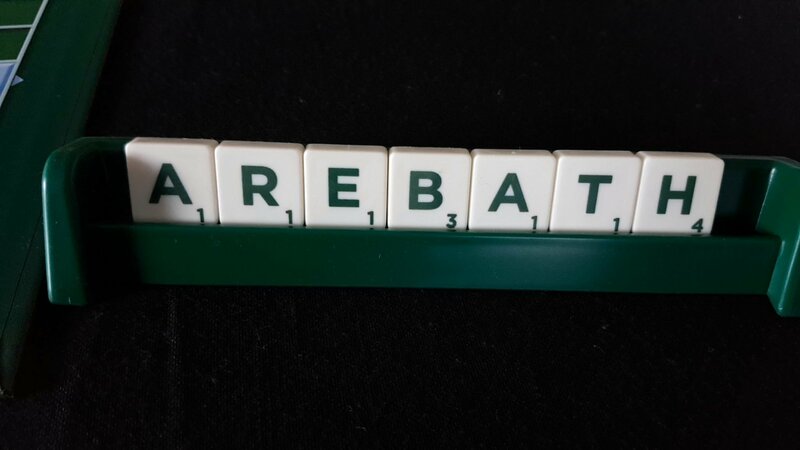 I always refer to Scrabble as a war-game because that’s what it is for me – a game of marshaling military resources (letters) for deployment (making words) at the right time in the theatre of war (board) in order to deny an opponent access to important strategic landmarks (scoring tiles). That requires a different kind of approach to the game. Don’t tell me though if someone introduced a ‘letter based wargame’ to Kickstarter you wouldn’t be intrigued. All that’s missing from Scrabble being the new Cult of the New darling is a comprehensive reskin and maybe some plastic minis. I’m glad to have finally taken the time to discuss Scrabble – old as it is it still feels fresh and exciting every time I play it. Invigorating, even. That’s because I know that every point will be hard-won and every tile will be hard-placed. I know at the end of it I will feel emotionally empty like I’d just gone through a psychological hazing, and so will my opponent. It’s no wonder really that people rarely play this with me more than once.